We start in the 1950s with Heinrich Böll’s Irisches Tagebuch (Irish Diary), a delightful collection of reflections and sketches covering his time travelling and living in Ireland. Böll has quickly become my favourite German writer, and his usual humorous, non-judgemental style works even better here in an informal setting than it does in his weightier (fiction) works. From a land far away, where people smoke anywhere and everywhere, pounds still have shillings, and footwear is a luxury, rather than a necessity (even in a country of incessant pouring rain), the German novelist brings forth the true character of the Emerald Isle. The work successfully evokes an image of an Ireland of the past, and while the writer touches on the down side of Irish life, the overall effect is one of a gentle, admirable way of life. In many ways this book reminds me of the way Luciano de Crescenzo (in Thus Spake Bellavista) lifted the life of Naple’s poor out of the gutter and gave it a sort of nobility in its (involuntary?) rejection of modern business norms. The anecdotes of the ‘bona-fide travellers’ who cycle from their village to another at least three miles away (passing each other in the process), in order to circumvent the Sunday drinking laws; the traffic policeman who, after a long meandering conversation, asks for a driver’s licence and is not at all bothered that the driver hasn’t got it; travelling from Dublin to the West of Ireland on the promise of paying at some later date: all these tales are told with a wry humour which emphasises the affection the writer has for the country, and people, he is describing. Let’s move on to the 70s and 80s now, as we take a look at life through the eyes of one of Roddy Doyle’s most impressive inventions, Paula Spencer. In my post on The Van, I mentioned that the slightly misogynistic view marred my enjoyment of the book: well, perhaps Roddy realised this himself. In the wonderful The Woman who Walked into Doors, Doyle creates a Dublin housewife, a prisoner of the soul-crushing suburban poverty of a poor country – and a victim of brutal abuse. Against a background of boom and bust, and the faded dreams of the Irish in a post-decimal, IRA-present, heavy-drinking (and smoking) era, Paula tells us how she met Charlo Spencer, how she fell in love (violently) and how she was knocked off her feet (metaphorically and then literally). Still in love with her husband, despite the frequent beatings, she drowns herself in drink, denying the abuse and making it through her days as best she can, trying (and failing) to bring up her four children properly. From the very start, we know that Charlo is dead, shot by the police at the scene of a violent crime – and we know that Paula is well rid of him. The first three-quarters of the book are absorbing and thought provoking: Paula is brutally candid about what she is, what she was and what she is unlikely to become. And then… And then Doyle lets loose. Where in the first part of the book the abuse is mainly hinted at, reported, suggested, all at once the reader is confronted with a sickening train of events, a constant barrage of attacks which leave us feeling almost as shell-shocked as Paula herself. The assaults pass by, one after the other, no end in sight… It is brilliant writing. It is horrible writing. For about six hours anyway! I’ve had a copy of Paula Spencer, the sequel to The Woman who Walked into Doors, for a fair while now, and this seemed like the perfect time to read it. We rejoin Paula about a decade later: the Celtic Tiger has roared, and panic-stricken emigration has now turned into mass European and African immigration; the Pound, whether decimal or not, has disappeared over the Irish Sea, replaced by the Euro; and cigarettes have finally become a social stigma with smoking banned in pubs and restaurants. Paula Spencer is actually less about Paula herself and more about the effect her marriage and her alcoholism have had on the people around her, especially her children. Emerging from decades of drunken numbness, she is trying to mend the ties strained by her neglect, mostly succeeding but, in Leanne’s case especially, occasionally unable to make things right. In Jon Paul, she has a picture of what you need to do to avoid temptation, but it is hard: very hard. Although it’s a good read, the sequel does not have the kick of the original. There’s no defining purpose to the novel, no scenes of physical abuse (or even the eventual disintegration of a family as described in Paddy Clarke… ). I kept thinking that there was a twist around the corner, that Jack could not be as well adjusted as he appeared, that Paula’s various ailments were concealing something more serious. It never appeared. Still, a third installment of Paula’s life would not come amiss. Perhaps a post-GFC story chronicling Ireland’s downturn and the wave of emigration back to Eastern Europe of the workers drawn by the Irish success story. 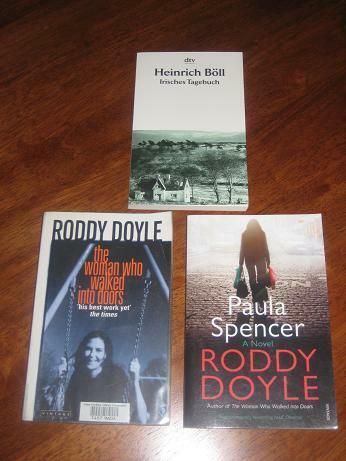 Roddy Doyle has already written The Barrytown Trilogy and the Henry Smart trilogy, so you never know. I wonder what Ireland’s future will bring… Sorry, my trip through time isn’t going any further today; you’ll just have to imagine it for yourselves. I read more Irish drama than I do fiction but there is something undefinable about Irish literature as a whole … it is a class apart and isn't given the recognition it deserves. I have read The Barrytown Trilogy (many years ago) and the first in the Henry Smart one but not any of the -currently two- Paula Spencer books. Roddy Doyle has been a bit up and down for me. Of the four I've read since starting this blog, I've loved two and found the other two OK but not amazing. I did like the Henry Smart book when I read it, so I might try the rest of the trilogy next. Aside from Joyce, I don't think I've read any other Irish authors though!